International television network beIN Sports launched a campaign to help break through the crowded TV sports space and share its fans' passion for soccer. International television network beIN Sports launched a campaign in the spring to help break through the crowded TV sports space and share its fans’ passion for soccer. 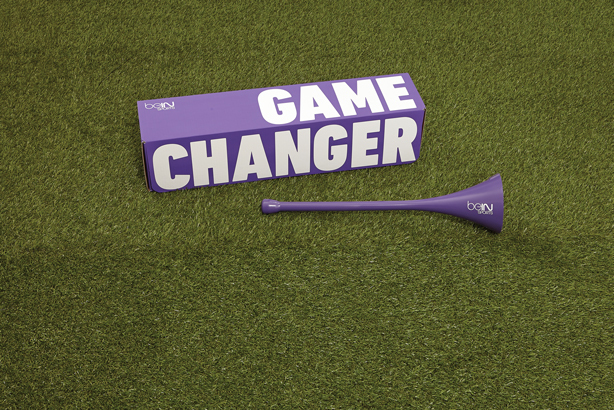 The Game Changer effort, created by beIN’s ad agency TBWA\Chiat\Day, gives consumers control by allowing them to change the TV channel to beIN by blowing a specially made vuvuzela, the South African trumpet used during soccer matches. The vuvuzela is outfitted with a microchip that reads soundwaves and sends a signal to corresponding cable boxes within range. BeIN kicked off the effort with a video that explained how the device works, which garnered more than 300,000 views. Twenty technologically advanced vuvuzelas were initially developed. Some were sent to influencers, others to fans that interacted with the network using #beINgamechanger. Within a month and a half of the launch, about 6,000 consumers entered for a chance to win one of the devices. Only a handful of fans will receive a vuvuzela and the agency will film the giveaways. Antonio Briceño, deputy MD of beIN, says the brand will maintain buzz by continuing to give out vuvuzelas to fans and documenting each exchange on its website and social channels. "BeIN Sports is researching and finalizing logistics for developing new Game Changer devices because of huge demand," adds Briceño. Pinta and TBWA partnered to deliver Game Changer devices to bloggers in New York after the campaign’s launch to show them how to use it, says Lauren Cortiñas, MD at Pinta. With coverage from media outlets such as Mashable, Sports Illustrated, and Fast Company, the brand garnered about 174 million media impressions. BeIN also saw a 10% increase in Twitter followers and a 34% jump in network subscriptions between March and May.